Republicans in Congress must believe voters are dolts. Nothing else can explain the tax bill that just passed the House with 227 Republican votes and no Democrats. No rational person would make the choices that are in this bill. Even granting that big GOP donors want this legislation, and that cutting taxes and spending are the core Republican mission, this bill is ridiculous. Anyone who voted for it should be drummed out of Congress simply for the insult. At a time when inequality has reached Gilded Age extremes, the Republicans will give fully one-half of the tax cuts to the top 1 percent. That’s not an economic strategy. That’s a plutocrats’ raid on the Treasury. Corporate profits are near record highs, and corporate taxes are declining as share of federal income, but Republicans hope to lard Big Business with the largest one-time cut in corporate taxes ever. Three-quarters of the benefits of the $1.4 trillion bill go to businesses—and those are permanent. The remainder that goes to individuals will end in eight years when Senate Republicans get done with it. Republicans actually voted to raise taxes on 36 percent of working and middle-class families. By 2023, only 40 percent of Americans would get a tax cut. The Senate bill is worse, raising taxes on families earning $10,000–75,000 over the next decade, according to the Joint Committee on Taxation. Citibank, Wells Fargo, Apple, Pfizer, and many others have for years successfully evaded paying taxes on $2.6 trillion in profits by cooking their books to report the profits as earned in foreign tax havens. Yet Republicans want to reward the companies for their past tax evasion and provide them a permanent discounted tax rate for tax-haven profits in the future. The cost of college is a national crisis—student-loan debt now exceeds credit-card debt—and Republicans just voted to add $71 billion to the cost of college over the next decade. Twelve million student-loan recipients will pay more, with the repeal of the deduction for interest paid on student loans. Graduate students will get taxed for the value of tuition that is provided by universities in their work-study programs. Disabled veterans and the long-term unemployed also lose in this tax bill: Republicans voted to eliminate the tax credit that gives employers an incentive to hire them. Thank you for your service. Republicans eliminated the deduction for high medical expenses that aids families dealing with the costs of long-term care, such as the elderly struggling with dementia. The disabled get hit too: The GOP legislation eliminated the tax credit that helped employers make their workplaces accessible to the disabled. The GOP aims to eliminate the estate tax, which applies only to fortunes over $5.4 million. 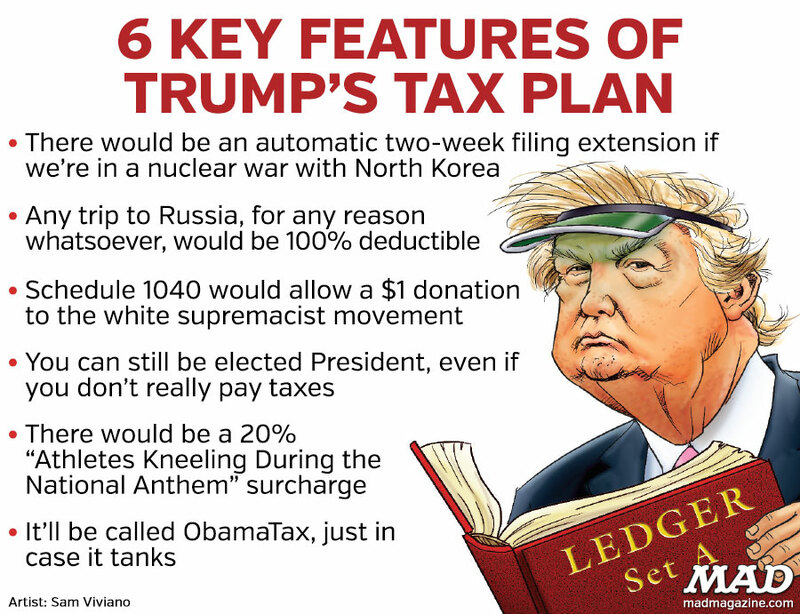 They also want a lower tax rate for those who are passive owners of a “pass-through” business as opposed to those who actively are building the business. Republicans are perversely selective in the loopholes and deductions they choose to preserve or eliminate. Despite Trump’s promises, they protected the obscene “carried-interest loophole” that enables hedge-fund billionaires to pay a lower tax rate than nurses or cops. Instead, they moved to eliminate the $250 teachers can deduct of the money they spend out of their own pockets on classroom supplies. Corporations can continue to deduct the expenses associated with moving jobs outside the United States. But workers will not be allowed deduct moving expenses when their employers force them to relocate. Interest expenses in commercial real-estate transactions remain deductible. Republicans ensured that golf-course owners like Donald Trump retain the tax break for not building on their golf courses. But Republicans eliminated the tax credit for investment in impoverished rural and urban communities with more than 20 percent in poverty. The trees are ugly, but the forest is even worse. At a time when we desperately need to rebuild America, Republicans have ignored real, pressing unmet public needs to shovel more money to the rich and corporations. If this bill becomes law, it will force immediate cuts across the board, including a $25 billion cut to Medicare. As soon as they finish raiding the Treasury for the big corporations and the wealthy, Republicans will start railing about deficits and push for more cuts in everything from education to Head Start. That isn’t just corrupt. It is criminal.